President Kufuor has ended his three-day tour of the Upper East Region with an assurance of a national accelerated economic growth next year if his government is retained in power. “We will perform miracles when we are given another term. This is because of what we have been able to achieve in our first term”, he stressed. 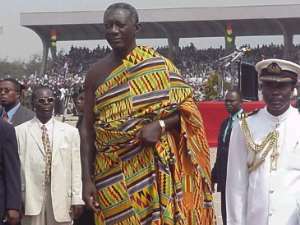 Speaking at a grand durbar organised by the Chiefs and people of the Bolgatanga traditional area yesterday, President Kufuor said the Government had firmly laid the economic foundation for an accelerated growth in the years ahead, and urged the people to renew its mandate. Addressing a durbar of chiefs and people at Bongo, the President also commended them for their acknowledgement of what the government has been able to do for them within the four-year term. President Kufuor later commissioned a ¢390 million street lights project for the area.